When most think of South Beach, they immediately think of a club scene and bottle service, myself included, but as I learned in my past visit it's actually possible to go to there and take it easy. You can really just go out for drinks at a quiet bar (!!!) and remember the night before hangover-free. I admit I was hesitant at first to leave my relaxing lounge chair at the luxurious 1 Hotel South Beach for the hectic SoBe life beyond resort grounds but I'm so glad I did. In fact I surprisingly enjoyed art-deco land so much that I am already contemplating my return. 27 Restaurant - This eclectic dining room, literally, is part of the Freehand hostel but don't let that deter you. The farm-to-table fare and hip atmosphere is one of the best on SoBe. And it's soooo not typical SoBe, which makes it SoCool. Beachcraft - No surprises, in a good way, at this Tom Colicchio restaurant located in the 1 Hotel. Similar to its sibling Craft in NYC, expect yummy food in a rustic-chic environment. Pubbelly - This true gastropub offers delightful small plates with an awesome Asian twist in a lively, sort of hipster space. And its location is off-the-cliche-path, which gives it an advantage in my book. Bodega Taqueria - A garage that's home to a funky-but-fantastic, casual taco bar in front and a hidden, trendy speakeasy in back. To find the alcohol, just look for a door to the bathroom (but it's really not the bathroom if you get the gist). Bazaar - For a fancy splurge at a see-and-be-seen place typical of SoBe, hit up this José Andrés Spanish tapas resto inside the SLS Hotel. Let the waiter help you decide on which plates to get, you won't be disappointed. Rosetta Bakery - If you're tired of paying hotel prices for a mediocre breakfast, definitely check out this little Italian espresso joint. Come early for the breakfast pastry otherwise you will be eating focaccia and mini sandwiches for breakfast, which is by no means a bad option at this place. Shepherd Artisan Coffee - A quaint little espresso bar in the Art Deco district that also offers egg breakfasts and acai bowls. A great pit stop when you're exploring the pastel playground. The Pool Bar at the Delano - An iconic palm-tree-lined pool makes for a great backdrop to enjoy your glass of rosé. The Martini Bar at the Raleigh - The pool bar is awesome too but this tiny, quiet bar inside takes the cake. It has a vintage, relaxed feel which is perfect for escaping the craziness. The Broken Shaker - This hip tiki-inspired bar that Hemingway would've loved is also located in the courtyard of the Freehand hostel and mixes up some of the greatest craft cocktails in the area. Grab a drink before heading to dinner at 27 (see above). Matador Terrace at the EDITION - A lovely outdoor sanctuary lightly lit with cafe lights serving up craft cocktails in copper pineapple cups. For a second I forgot I was in Miami. The lanterns make the Matador Terrace extra cozy, don't you think? The Social Club at Surfcomber - Fun, handcrafted cocktails served in a swanky, artsy spot. Explore the retro Art Deco district which is roughly between 5th and 15th Streets. If there's only one spot you see, make it Lummus Park at Ocean Drive & 7th. This area is quintessential Miami Beach. Anyone recognize the Carlyle from Miami Vice? Just missed Crockett and Tubbs at the Clevelander Bar…only about 30 years too late! Rent a bike from the numerous CityBike stations and take a ride along the Miami Beach Boardwalk which runs from mid-beach around 46th Street all the way down to the tip of South Beach known as South Pointe Park. Warning: in the summer it can get VERY hot, so morning bike rides are best at this time of year. Bowl a strike or lace up those ice skates at Basement in the Miami Beach EDITION hotel. Who ever thought you could find something like this in Miami Beach? With a DJ spinning some great hip-hop throwbacks, it was quite the little hotspot even on a Sunday night. Bask in the sun and go swimming in the aqua-blue sea. I mean after all, this is SoBe! But be on the lookout or the purple flag at the lifeguard stands. Apparently that means dangerous marine life and unfortunately I did not realize that until AFTER the jellyfish stung me. 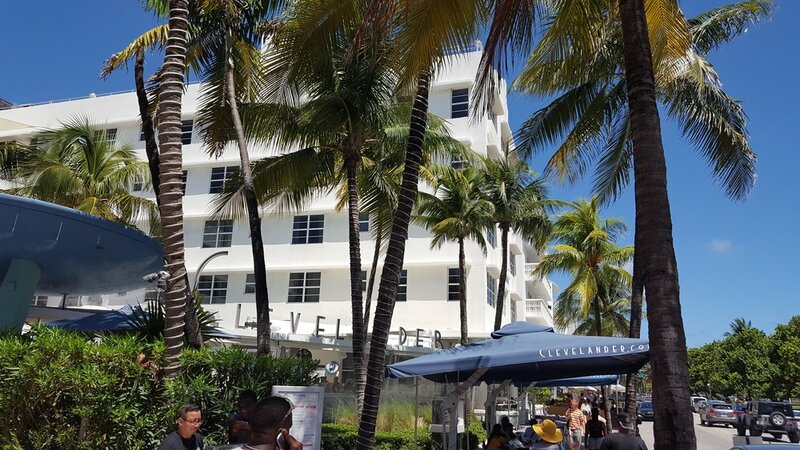 Lastly when you're searching for a place to stay, it helps to look for hotels on the Northern edge of SoBe, or mid-beach, which is well above the Art Deco district. They are going to be more low-key but still close enough to all the action if you decide to make a night of it. My previous post helps you do just that so be sure to check it out if you haven't already. 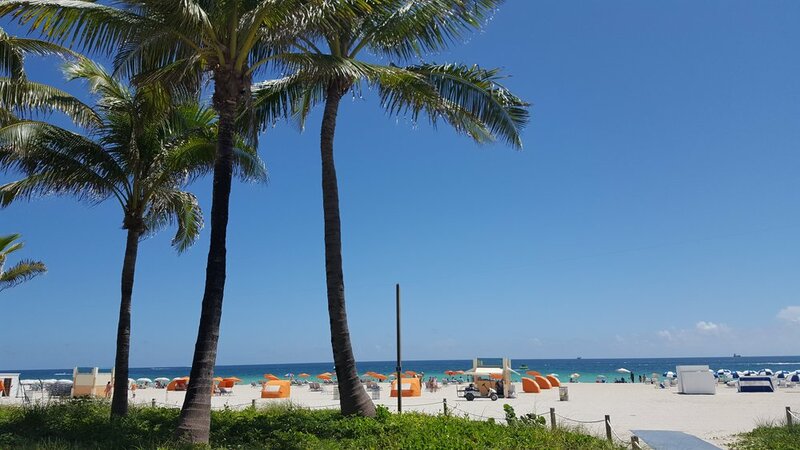 If you're looking for a refined, relaxing, beach vacation, definitely consider SoBe rather than rule it out. As I mentioned before, it's totally possible to avoid the raging party scene in a place that's known for its craziness and enjoy it.